Hang around long enough and everything will change, practically in front of your eyes. Businesses will close and others will open. Houses will get demolished while new ones or condos will spring up like stringy fungi. 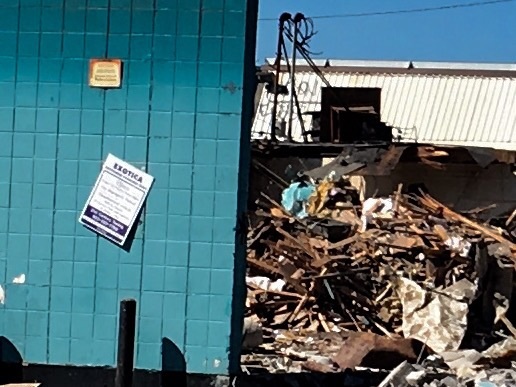 I held on to a quiet comfort whenever I passed by the intersection of North Argyle Street and Columbia Blvd. I made a point to look at the pipe sticking out of a cement pad. At the base of the pipe I would spot the Dark Island sign. There was a certain satisfaction about being clued into a secret world. The mysterious origins of the sign and function of the pipe sparked my imagination. There’s subversion in these parts I always thought. The who, what, when, where, why and how didn’t really matter. Somebody put up a goofy sign and it managed to stick around. This freed me to wallow in the ecstasy of suspended speculations. In a previous blog post I vowed to place a call or, my guess, a series of calls to the Portland Water Bureau in an attempt to solve this Dark Island mystery. Procrastination to make such a call was made easier by the fear of getting tangled in buearcratic channels of our local government’s water department risking ridicule, ignorance and incompetence (my own more likely) in figuring out a way to ask about or explain the Dark Island sign. It is no longer an issue. The pipe including the sign has been painted over. 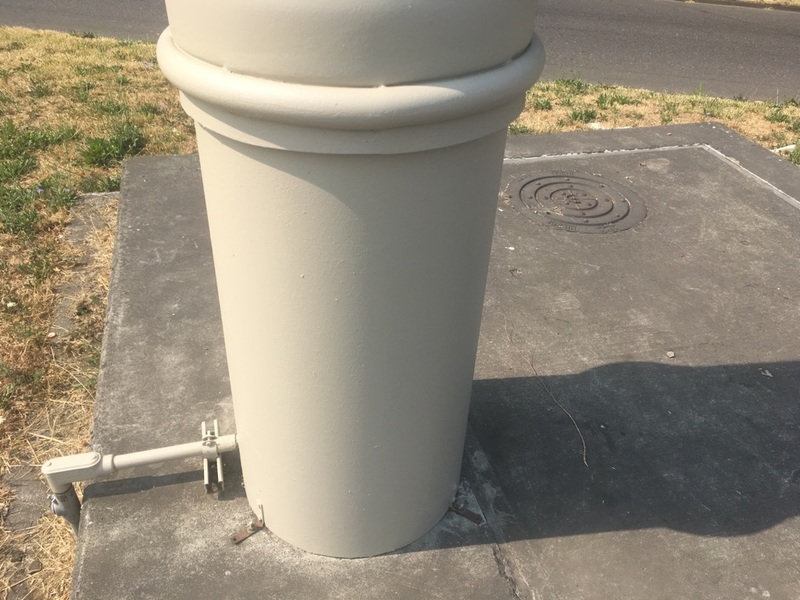 Looking cleaned up and refreshed, this piece of sewer equipment has been spruced up with beige paint. 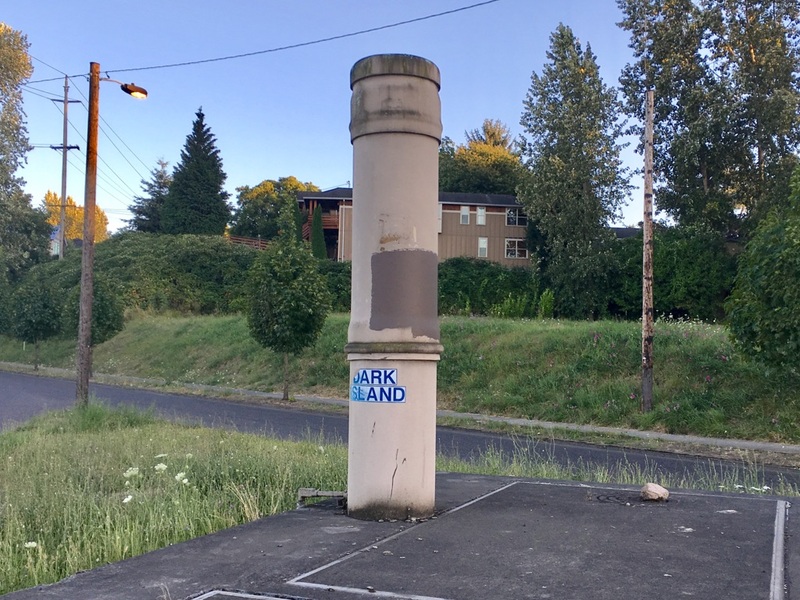 What other color than the most inoffensive one could be considered to paint a pipe connected to the nearby sewage building and in the meantime obliterate that Dark Island sign? It’s somehow more than perfect. The mysterious sign in gone. It’s more likely that it was peeled off unceremoniously in the refurbishing process rather than painted over. It’s the end of Dark Island. I’ll always remember the unsolved mystery and think about the legend. Whether there’s a sign or not there will always be a Dark Island in my mind. 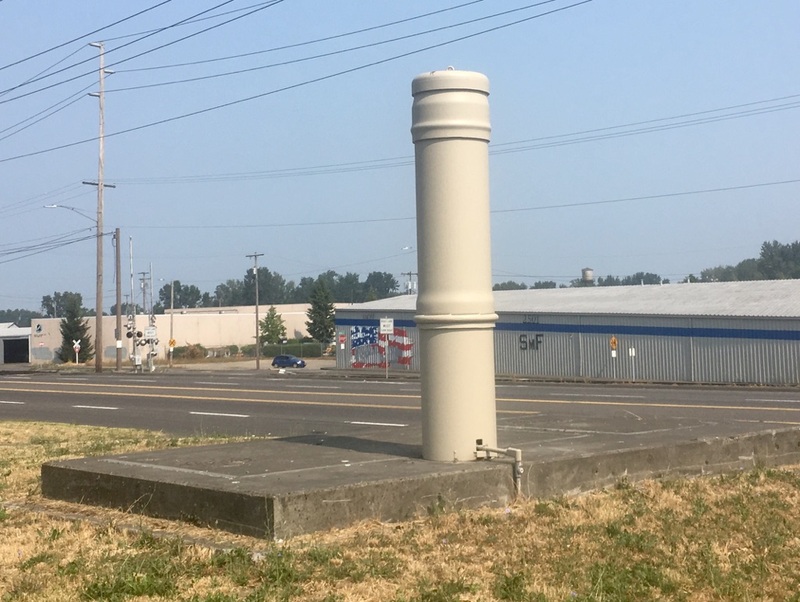 I queried the Facebook group Hidden Portland for the Curious and received responses that gave me more of a sense of the function of the pipe but no one offered information about the sign. There’s no need to speculate anymore. The storm cloud that seemed to be perpetually hanging over my little island, the one that kept me in the dark, has been brushed away with beige paint. I feel like that mysterious reminder and my need to contemplate it have been taken away. 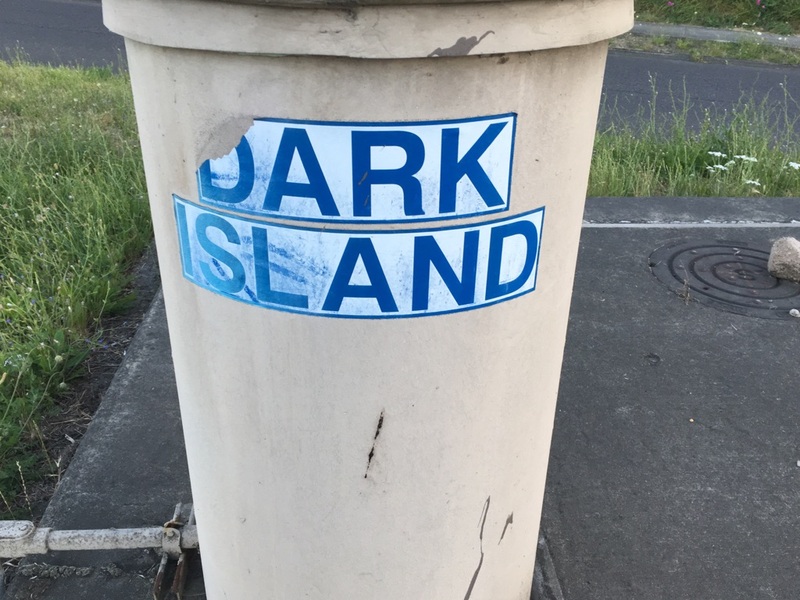 Dark Island, I will miss you as you have passed from this world and into your current role of a subtle, yet sad landmark to not much of anything. I’ve already written the obituary for Exotica. It seemed obvious at that time that the place would be closing for good. I’m mourning my inability to take a satisfactory photo of the establishment that I thought it deserved. Back then my assumption that the place was kaput was proven wrong by a sign on the cracked glass door stating the place was closed for repairs. A reprieve! Thank you, Governor! I wasn’t even embarrassed that I had written an obituary for a place that wasn’t dead yet. The promised repairs never occurred. Months later there was no evidence of visits from interior painting crews or teams working to replace the carpet. There was no sense of anything was getting fixed. I would have been curious to know if any exterior renovations had been planned. The death knell for me was when the bird bath on the side lawn went missing. 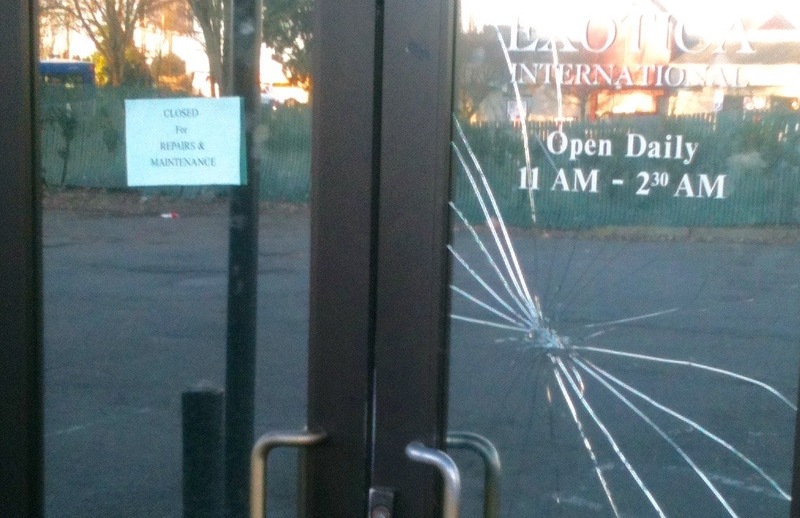 This, even more than the smashed door window, the missing “L” on the Lounge sign and the graffiti bombing to the building’s facade, seemed to be an indication that the efforts to bring the club back weren’t going to happen. It felt like defeat. When I read about the tribulations of the Exotica owner in an article in the Willamette Week which described a minority business owner being hassled by the City of Portland it made sense. To me Exotica was a mythic place in a strange location sandwiched between a fast food restaurant and a cookie factory. Not one to frequent strip clubs, I was never sure what went on there besides what was probably the usual barrage to the senses of late night ladies gyrating to loud music (in this scenario it’s Middle Eastern disco) while lights swirl around the club’s interior. Billed as an international establishment, I’d like to think it was a place where people of all nationalities could appreciate this environment together. 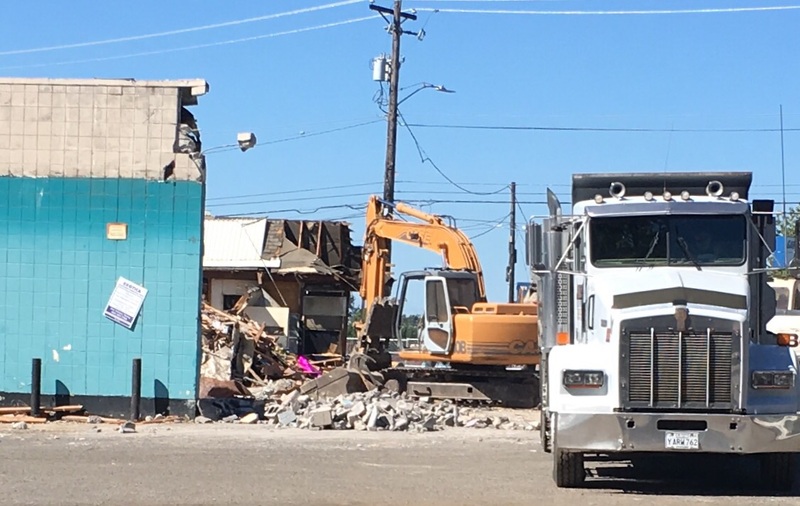 Late one afternoon, I discovered it unceremoniously being bulldozed. 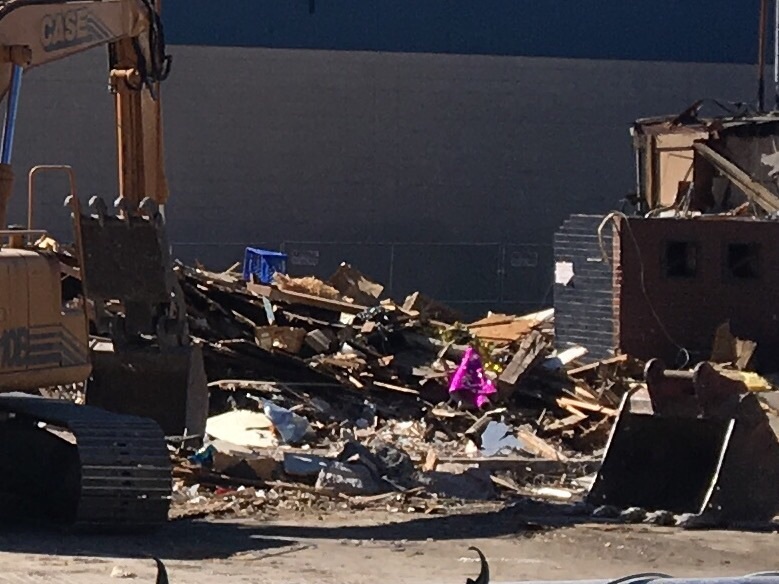 I didn’t get back for photos until it was mostly demolished. 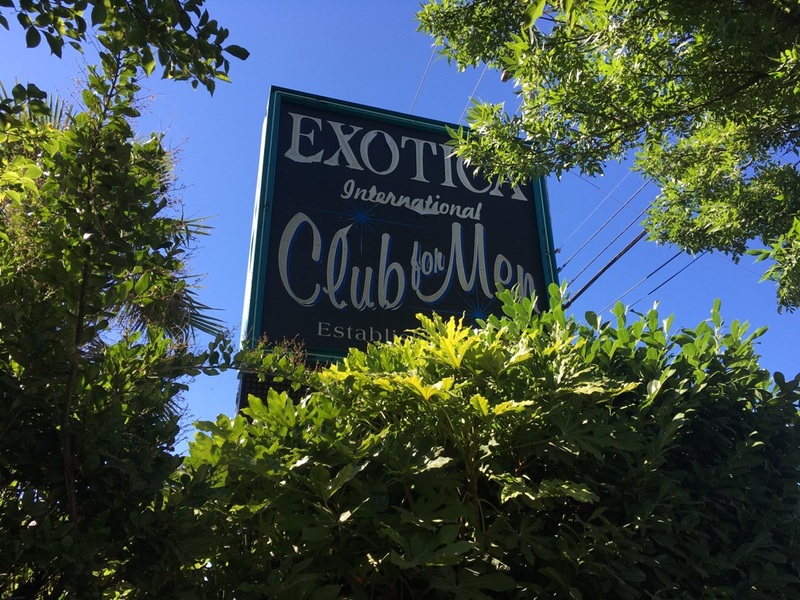 Portland has plenty of strip clubs but it has lost its international club. Regardless of whether I partake in this kind of business it’s important that these places exist to provide an outlet for the subcultures that need them. Update: It looks like a Carl’s Jr. will be built on the site of Exotica. It will next to a Jack in the Box and across from a McDonald’s. I see a “hot corner” of fast food happening at this intersection of MLK and Columbia Boulevard.